Winter sports are recreational sporting activities performed on snow or ice. 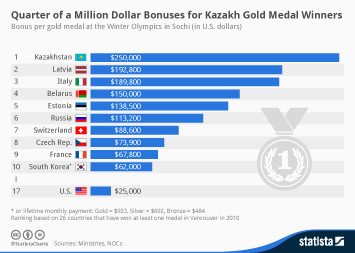 These include both individual as well as team sports such as ice hockey, figure skating, snowboarding, cross-country skiing, ski jumping, speed skating, Alpine skiing, bobsledding and snowmobiling. The main international winter sport event is the Winter Olympic Games. In the United States, skiing and snowboarding are among the most popular winter sports. In 2017, the number of skiers in the United States amounted to around 14.94 million and the number of snowboarders in that year was at about 7.56 million. During the 2017/18 ski season there were 472 ski resorts in operation in the United States with an estimated number of 53.3 million visitors during the 2017/18 season. The state of New York has the highest number of operating ski areas in the United States — 51 as of the 2017/18 season. Ice hockey is one of the most popular winter sports in North America, particularly in Canada and in some northern states of the United States. In 2017, wholesale sales of ice hockey equipment reached almost 260 million U.S. dollars. In 2017, there were around 2.54 million ice hockey participants in the United States and about 556 thousand of these participants were officially registered ice hockey players. The National Hockey League (NHL), comprising of teams from both the United States and Canada, is the biggest professional hockey league in the world, with its total league revenue amounting to around 4.43 billion U.S. dollars in the 2016/17. Number of participants in skiing in the U.S.